Jade Davis was just looking for a place to park and retrieve a misplaced toy for her 5-year-old son. 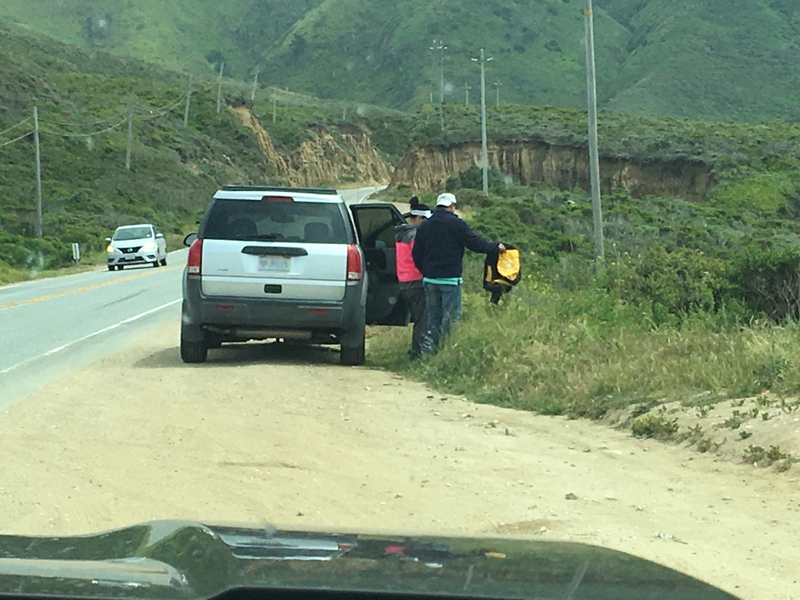 On a recent Saturday, she and her family day-tripped to Big Sur, just over the hill from their home in Carmel Valley, and stopped at a Highway 1 turnout north of the Soberanes hiking area. She decided they’d have something to eat as long as they were there. But then she noticed something weird: a man and woman climbing up the cliff and loading succulents into the back of a van. “I was so shocked to see these people doing this,” Davis said in an email. She’d been a wildlife enthusiast for many years, and knows it’s illegal to remove native plants from wildland areas. Although the couple took off, Davis managed to get photos of them and the van’s license plate. Davis also reported the May 5 incident to Monterey County Sheriff’s Department, which alerted the California Department of Fish and Wildlife, which handles law enforcement cases involving plant life. That led to a remarkably fast bust late last week, where hundreds of native succulents were recovered from a location in Palmdale, east of Los Angeles. Plant theft has been a concern for decades in England, where some botanical gardens have been forced to put rare plants under lock and key, and some native species have been wiped out by collectors. It was the first such incident of large-scale plant poaching reported in Monterey County, but comes hard on the heels of arrests in thefts involving plants in Humboldt and Mendocino counties, specifically involving a species called Dudleya farinosa, commonly known as bluff lettuce or powdery liveforever. Plant thieves were stripping the succulents from the coastal bluffs and smuggling them to Korea and China, where the plants reportedly sell for as much as $50 each. 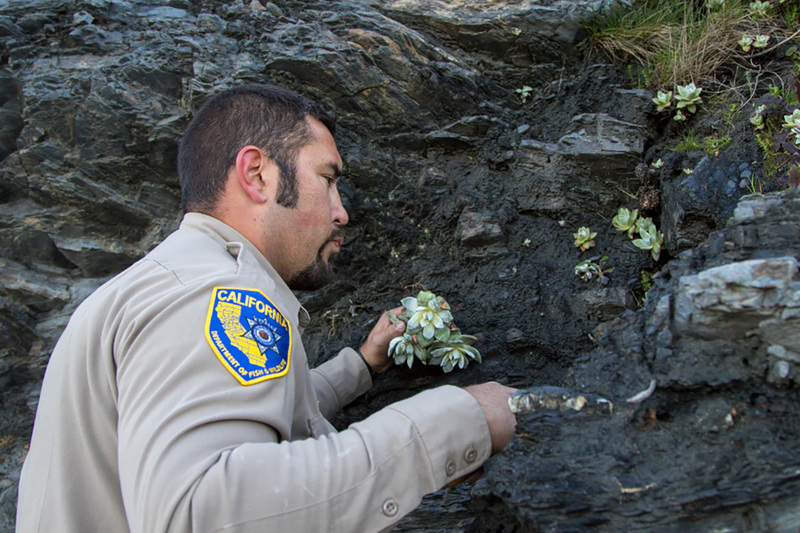 At least three different species of dudleya were stolen in the Big Sur incident, according to CDFW. As succulents have become the darling of designers and a staple for home and garden décor, so has the desire grown to possess rare species — and an illegal trade in pilfered plants is growing exponentially. Plant theft is nothing new. It has been a concern for decades in England, where some botanical gardens have been forced to put rare plants under lock and key, and some native species have been wiped out by collectors. In Vietnam, a plant discovered in 1999 became extinct in the wild just five years later, also the victim of overenthusiastic collecting. “It’s just one of those things. It goes in waves,” said Stephen McCabe, a dudleya expert and emeritus director of research for the UC Santa Cruz Arboretum, when asked why suddenly Dudleya farinosa has become an object of desire for Asian plant collectors. Robin Stockwell, a longtime succulent grower who founded Succulent Gardens in North Monterey County, said he’s seen the trends come and go during his decades in the business. Thieves are meeting a new demand as the middle class in China and Korea has expanded with more disposable income, and perhaps inspired by all those pictures of succulents that dominate Pinterest and Instagram. 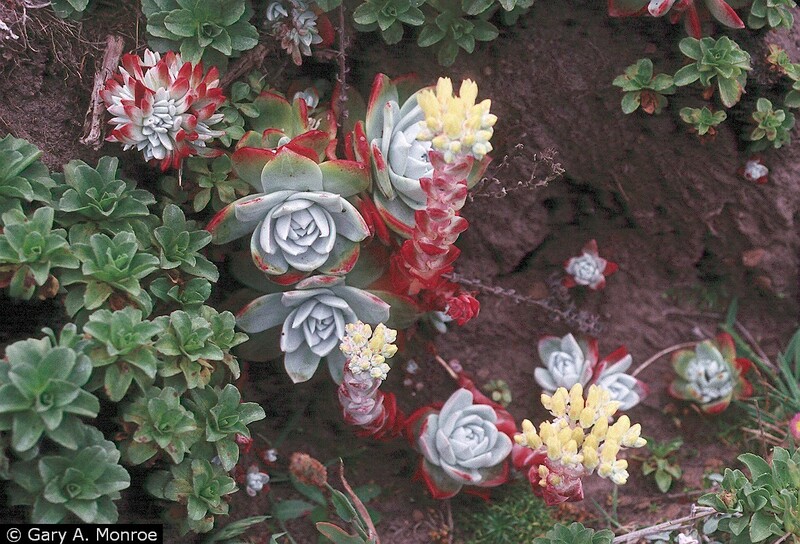 Dudleya farinosa blankets rocky cliffsides in profusion, sending out stalks of yellow blossoms in the summer months. It does not have the languorous appeal of a rare orchid or the macho stance of a towering saguaro, yet this plant has become sought after by collectors in Asia. It may be because it resembles another rare dudleya from Baja that has also been targeted by illegal collectors, McCabe said. Dudleya farinosa is what he calls “the poor man’s version,” and it may have become an easier substitute. On May 5, when Davis pulled into the turnout, she and her son had been there just a few minutes when she noticed two people coming up off the trailhead. “They were moving slowly and even though they were partially blocked by the bushes at first it looked like they were carrying something,” she writes in an email. “As they emerged into the turnout I saw they had three bags, the woman had one in each hand (a potting soil bag and a green plastic bag) that were heavy enough to weigh her down. The man had one large duffel type bag that was full and clutched between his two arms to his chest. He was also bent over with the weight. She continued to watch and saw the woman pull a dudleya from the bag and put it in the car. “The moment I saw what they had, I immediately got out of the car and approached them. I know that removing succulents from a protected area is not only illegal but extremely damaging to the ecosystem, so I did not want them to just leave with no repercussion,” she wrote. Davis confronted them, and says the couple acknowledged that they knew stealing native plants was illegal. Habitat devastation is a particularly prickly subject in Big Sur, due to ongoing issues of trash and trespassing that occur in the coastal village, with often blatant disregard for the environment — despite the fact that it is the natural beauty that lures more than 1 million visitors each year. The initial report was posted on Big Sur Kate’s blog, by Kate Woods Novoa. Plant theft is more common than you might think. Thieves will steal freshly laid turf, landscaping plants, and even dig up mature trees for resale. In Britain, the theft of rare plants from arboretums and public gardens is rampant. But there’s something particularly unsettling about the trend in taking plants from the wild. There’s long been a particular problem with saguaro cactus in Arizona, which take decades to grow their characteristic “arms.” Officials are now tagging some specimens in Saguaro National Park near Tucson with microchips so they can be identified if they go missing. What is different these days is the scale of these plant-scalping operations. Organized theft rings aren’t just taking a few plants — they’re harvesting them by the ton, as happened a few years ago with a recovered shipment of Dendrobium nobile, an Asian orchid. Wild dudleya seems to be especially profitable for thieves, since it can be harvested from remote areas where intruders may go unnoticed. Tragically, McCabe said, almost all of dudleya that do make it to Asian countries will probably die: “They’re extremely hard to grow in high humidity regions” such as Korea, China and Japan, he said, unless they’re placed in greenhouses with fans and dehumidifiers. Jade Davis’s report and photos were what made the difference in the Big Sur case, says Capt. Patrick Foy, a law enforcement spokesman for CDFW. Right now the investigation is still active and arrests have not yet been made, although more than 600 plants were recovered. “It’s all very new,” said Foy of investigating and prosecuting these kinds of cases. At this point, he’s not sure if the Monterey County district attorney’s office or Los Angeles County District attorney’s office will handle the Big Sur incident. More than 2,300 Dudleya farinosa were recovered in that case, and most of them have since been replanted back in the wild. When all this first broke, Foy said, “We were all a bit worried about how district attorneys and the public would perceive this. But we’ve had overwhelming support, and that’s a good thing. Anyone who observes poaching or polluting in wildland areas is urged to call CalTIP, a confidential secret witness program, at (888) 334-2258, or to text to tip411. Callers can remain anonymous, if desired, and a reward can result from successful capture and prosecution. McCabe has another strategy: to get as much Dudleya farinosa into the marketplace as possible in order to dilute its appeal as a rare plant. “They’re easy to grow from seed, and I encourage people to do that,” he said.